What initially began in 1942 with three Oklahoma conservationists brainstorming about how to get local youth interested in the field of soil science and management of soils, has since grown to be a nationwide program to engage students in deepening their soil science skills in a compelling, competitive context. Such contests challenge students to develop their ability to evaluate a site’s capacity for agricultural uses based on hands-on probing of the soil in a pre-dug pit, looking also at soil colors, textures, layers, depths and slope. Each carefully-structured competition includes guidance and scoring by professional soil scientists. Such hands-on, contextual learning is uniquely valuable given the complex nature of soils and landscape, not to mention the opportunity to interact with professionals and exposure to related career opportunities. 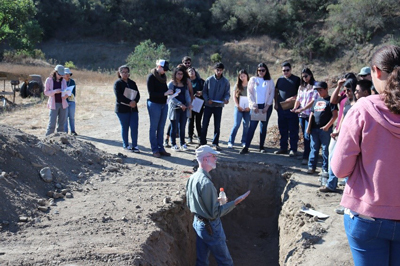 Land Judging contests are a collaboration between the Future Farmers of America (FFA), Resource Conservation Districts, agricultural education teachers and (in California) Cal Poly San Luis Obispo. This year, RCDMC will host its 4th land judging contest in recent years on a Salinas Valley farm, as hosted by Rincon Farms and the Buena Vista Grange out amongst vegetable fields with the Gabilan Mountain Range to the east and the Sierra de Salinas to the west. Land judging contests have a long history in Monterey County, a tradition we are proud to carry forward. Prizes in Monterey County include scholarships to the California Natural Resources and Range Conservation Camp, a week-long summer camp at Elkus Ranch near Half Moon Bay. Winners also have the opportunity to advance to regional, state and national FFA-sponsored competitions. Each Land Judging pit site includes the toolkits students will need to conduct their land judging-- a water bottle, tape measure, slope finder and soil probes. Students are allowed 20 minutes to assess the characteristics of each pit and adjacent land surface, using individual score cards and provided toolkits. In addition to noting observed soil and land surface characteristics, students must also interpret them in relation to their effects on plant rooting depth, water penetration, water holding capacity, erosion and flooding. Taking all these factors into account, the student judging the land ultimately classifies it based on its land capability for agriculture and rates the land for other land uses like building sites or wildlife and recreation.